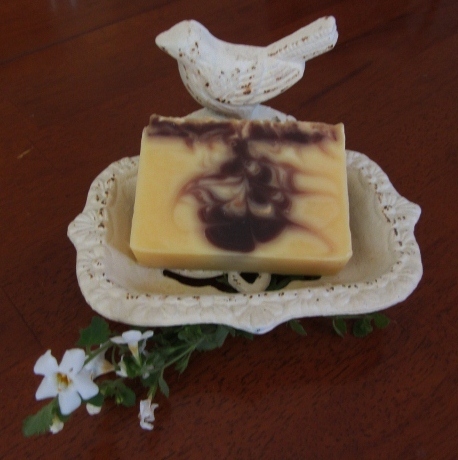 Sharing the art of handcrafted soap. I thought it would be fun to participate in the Great Cakes Soapworks Challenge Club for January. I found the technique for this month, the Circling Taiwan Swirl, to be just that, fun....and challenging, too! In starting, I first wanted to make a decision about scent. Since the soap batter would need to remain fluid for as long as possible, I wanted to be sure to use a fragrance that wouldn't accelerate trace. Based on what I had on hand, I decided to use lavender essential oil. That would be a safe choice! The next step was to create dividers that would provide four needed spaces for the pour. (Since making these by hand, I've decided that purchasing a set would be a great investment!) I used thin cardboard, measured and cut to the right lengths. I wrapped the pieces that would be in contact with the soap with Glad Press'n Seal wrap that I found in the back of a kitchen drawer. I'm not sure if they even make this product any longer, but it worked like a charm! After getting my divider system ready, next was to choose colors that would help define the design. White, as a background for darker colors, always creates a nice contrast, so I decided to go with a combination of pearly white mica and titanium dioxide. I also wanted colors that would be complementary to the scent I was using or, at least, wouldn't oppose it. Two shades of purple with deep pink would do the trick! Making progress, I prepared my oils and lye solution, then gathered everything together. ( For safety, I always leave my lye solution container in the sink until it is cooled and ready to add to the oils. It's close by, but not in the photo below). At this point, taking time for photography wasn't an option. 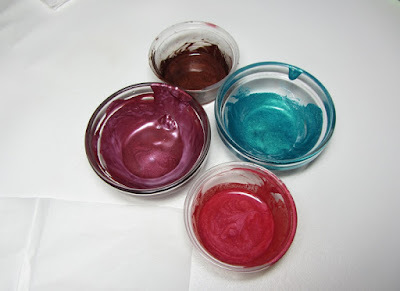 However, there was time for breath-holding as I added fragrance and blended my colors! 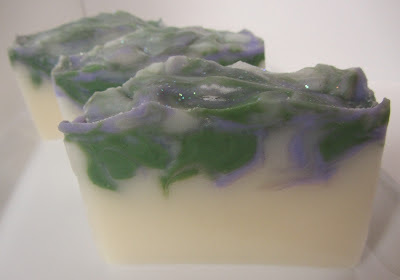 Even using lavender essential oil and feeling confident that it wouldn't accelerate trace, I stressed a little about getting the soap batter to the point where it wasn't too thick or too thin. Isn't that the challenge with just about every batch?? In the end, it worked out. 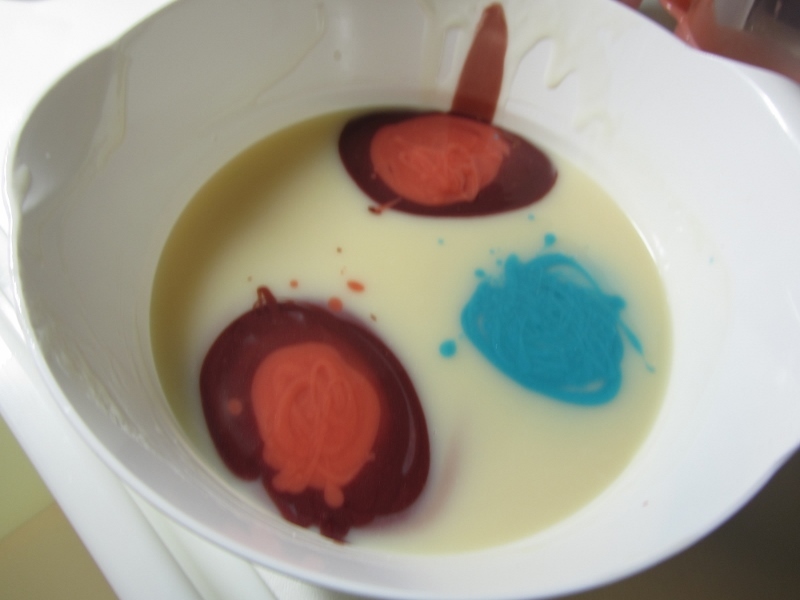 By the time I was pouring the last of the soap, it was starting to thicken up, but not too badly. I used a 1/8" diameter dowel stick to accomplish the Circling Taiwan Swirl technique. Here is an in the mold photo. I sprayed the top with 91% strength rubbing alcohol. 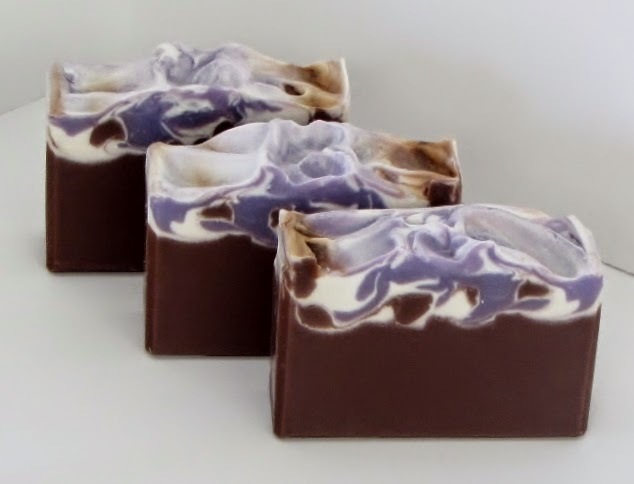 David Fisher, soap guru from About.com says that from his experience, soap made with lavender essential oil can tend to cause ash. Even after spraying a few times with rubbing alcohol, then covering for 24 hours, I found this to be true. I also poured at cooler temperatures (around 85 degrees), which may also contribute to ash forming. If anyone has experience with ash as a result of either fragrance or low pouring temperatures, please feel free to share in the comments section at the end of this post. I'd be interested to hear about your experience! I cut the soap log vertically into three 2 1/4 inch sections, then cut each section horizontally to reveal the design. The photo below was taken shortly after cutting. The soap was quite soft at this point and had to be handled with care. Here is the final result after curing and a little clean-up. I'm happy with how it turned out! There are so many beautiful Circling Taiwan Swirl challenge entries this month. Good luck to all! This is the third time I've participated in the Soap Challenge Club sponsored by Great Cakes Soapworks but only the first time I've posted about my experience in this blog. I've been a fan of Clyde from 'Vibrant Soap' for quite awhile and was excited to try one of his techniques. 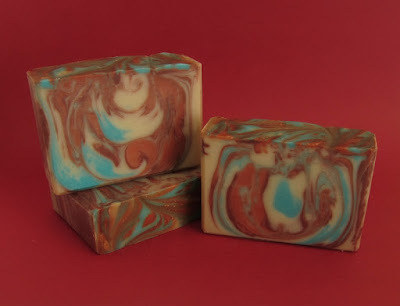 It seems that color always plays such an important part in the end result of any soap making effort. I wanted to be sure that there would be contrasting colors in this project. The colors I chose were merlot, coral, cappuccino brown, and teal green...all micas. I only used a total of three colors, combining a small amount of brown with merlot to create a deep shade of rust. Once combined, I added the rust, coral and teal green into a base of white. The teal green is more turquoise than I would have liked, but it still ended up being a nice contrast. 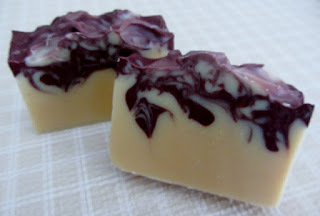 The soap batter was fluid (light trace) at pouring due to a non-accelerating fragrance, Rustic Woods & Rum from Bramble Berry. Using the funnel pour technique, I alternated coral and rust and poured teal only at the top of the bowl. This variation of Amy's tutorial is one that was in one of the links to Clyde's youtube videos. I had hoped for a little more 'feathering' than shows in the above photo. To finish, I swirled the top and waited 24 hours for the unmolding. 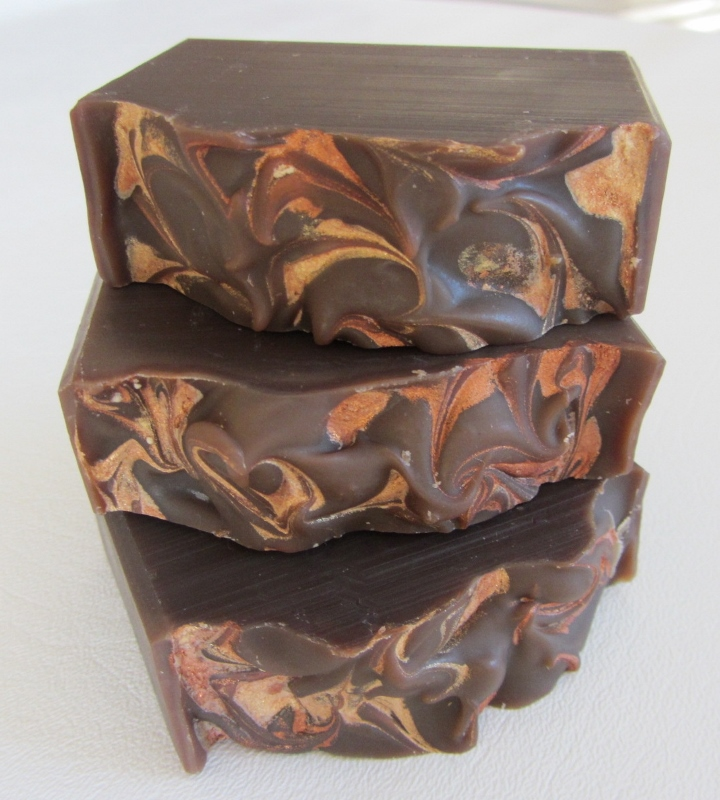 The cut bars show some pretty interesting swirls. 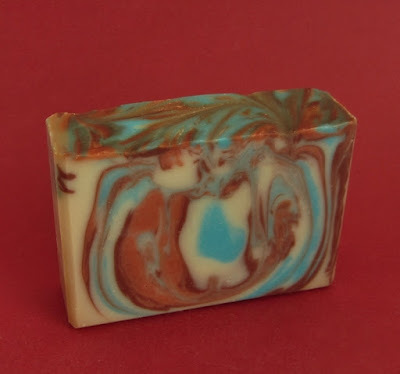 The 'feathering' is subtle and shows up in some unique places within the soap. I like it! This is a technique that I'll definitely try again. I recently decided to do an experiment of sorts using a fragrance that had a vanilla content of between 9-10%. It is a lovely scent and one that I would like to use on a regular basis. As part of the effort, I used the same base recipe for each of two batches. For the first batch, I separated out a portion of the emulsified soap mixture and colored it a lovely shade of purple. 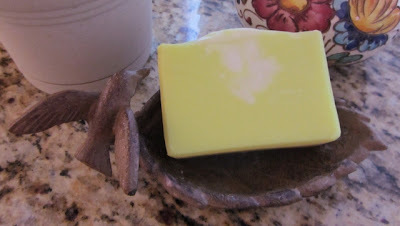 I added the fragrance oil to the remaining soap mixture. I wanted it to be a nice, creamy white in order to provide a contrasting back-drop to the beautiful purple. In order to help counteract the vanilla content, I added titanium dioxide to this portion. 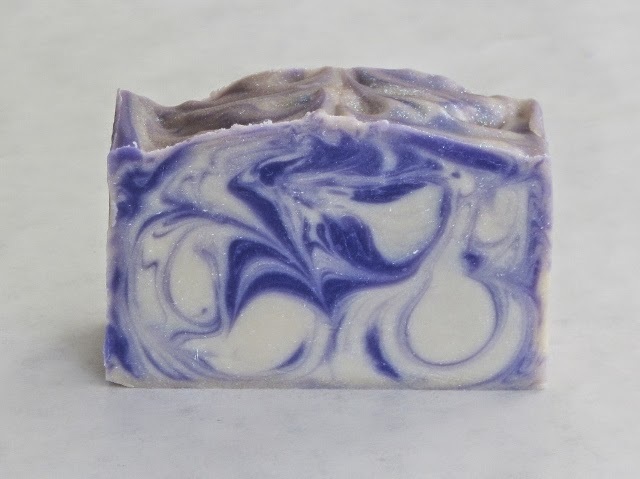 I poured it into the mold, doing a drop swirl with the purple and finishing with a light chopstick swirl. Below is a photograph taken after unmolding the next day. The color contrast was beautiful and just what I had wanted. In spite of my satisfaction, I felt that it would only be a matter of time before the white would start to darken. Even then, I wasn't feeling at all confident in the addition of the titanium dioxide! The photo below was taken one month later and it is easy to see that the vanilla turned the creamy white into a somewhat mottled shade of brown. For the second batch, rather than trying to avoid the effect of vanilla, I decided to work with it instead. Once again, I used the same recipe as before and after blending the oils and lye, I separated out a portion of the emulsified mixture. This amount would be divided in two portions, one that would be colored white and the other purple. 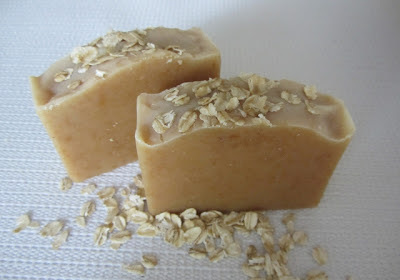 I added the same fragrance oil used in the first batch to the remaining emulsified soap. I added brown mica to this larger amount in order to 'assist' the vanilla content in the fragrance. After pouring it into the mold, I topped it with the remaining portions using the nicely contrasting colors of purple and white. Below is a photo taken after unmolding the next day. I was so impressed by the finished product and not concerned at all about the vanilla. If the main portion turned darker (it would), all the better! The color has turned into a rich, deep, chocolate brown and is so pretty. Best of all, I was still able to incorporate the purple and white colors that I had wanted in the first place! From now on, cooperation will be the name of the game when working with vanilla fragrances. Is 'friendship' possible with vanilla? I think it is! Inspiration for soap design can be found in so many different places. Some of my favorite inspirations come from delicious food recipes, especially desserts and beverages. Both lend themselves to fun and sometimes easy recreations in soap. Who wouldn't love to try their hand at soaping a batch of double fudge brownies with ice cream, or pumpkin mousse triffle topped with whipping cream? That certain cup of chai tea or mocha latte mustn't be overlooked either! More challenging inspirations can come through scenery, including sunsets, majestic mountain peaks, beautiful lakes, colorful forests, and of course, sandy beaches that stretch into endless oceans. 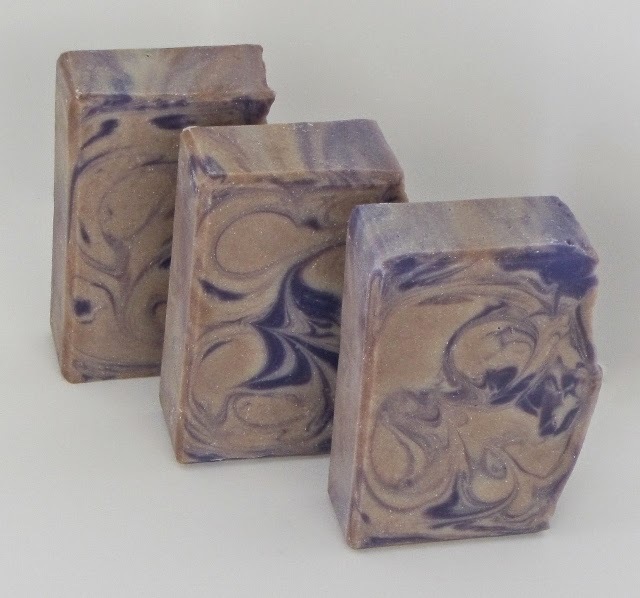 I've seen incredible examples of these re-creations in soap that are nothing less than true works of art! I aspire to that but am afraid that my creativity doesn't extend to that level. I have a great appreciation for those who have achieved such intricate designs! Other sources of inspiration can come from photographs where color reigns supreme. Scenic photographs might fall into this category. In this case, though, it is color that is the overriding factor, not so much the land or seascape. On the opposite end of the spectrum is inspiration from abstract art or even color palettes that are used in home or clothing design. There's no doubt that these combinations are put together with a definite understanding of and appreciation for color. Beautiful! 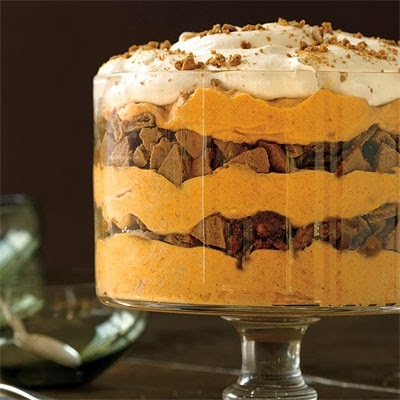 The recipe consists of pumpkin mousse layered with crumbled gingersnap cookies. Isn't it a delicious looking dessert? My experience in using this masterpiece as inspiration is documented in the post "Pumpkin Snap" from the fall of 2012. As mentioned there, I definitely had some breath-holding moments as I tried to get the layers in place before the soap got too thick. I did take some liberties, and while it isn't an exact replica, I was happy with the result. The Spiced Pumpkin and Gingersnap fragrance oils together were to-die for, by the way! 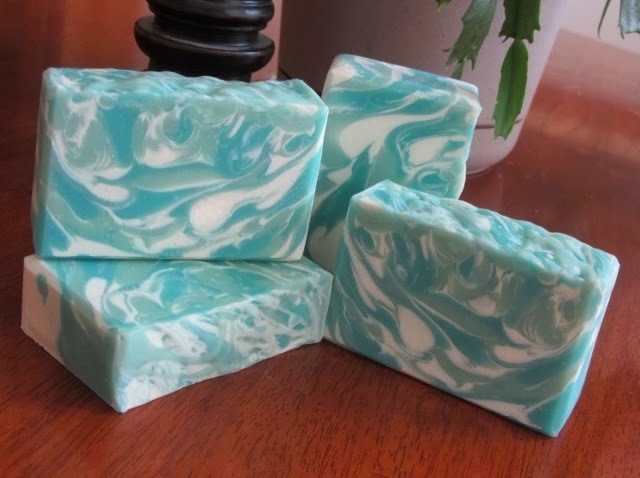 The second soap that I would like to share was inspired by a photograph taken when my husband and I took a cruise to celebrate our wedding anniversary. The colors in this photo are the main attraction and, in my opinion, gorgeous! 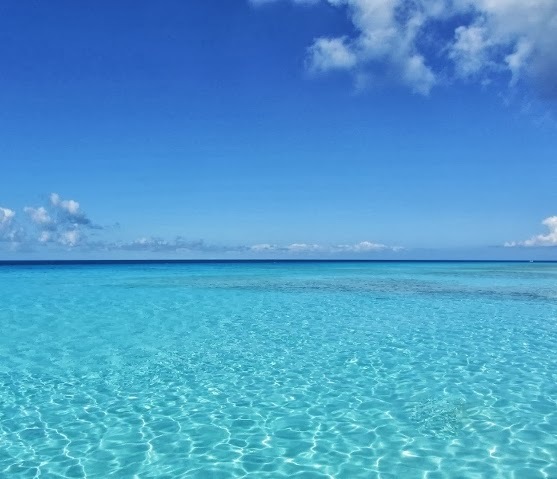 The beautiful turquoise and aqua water against the blue sky backdrop is what caught my attention. I've never made a soap using these colors before and honestly, it surpassed my expectations. I simply love these colors! So, there you have it, a couple of examples of inspiration brought to the soap making table. 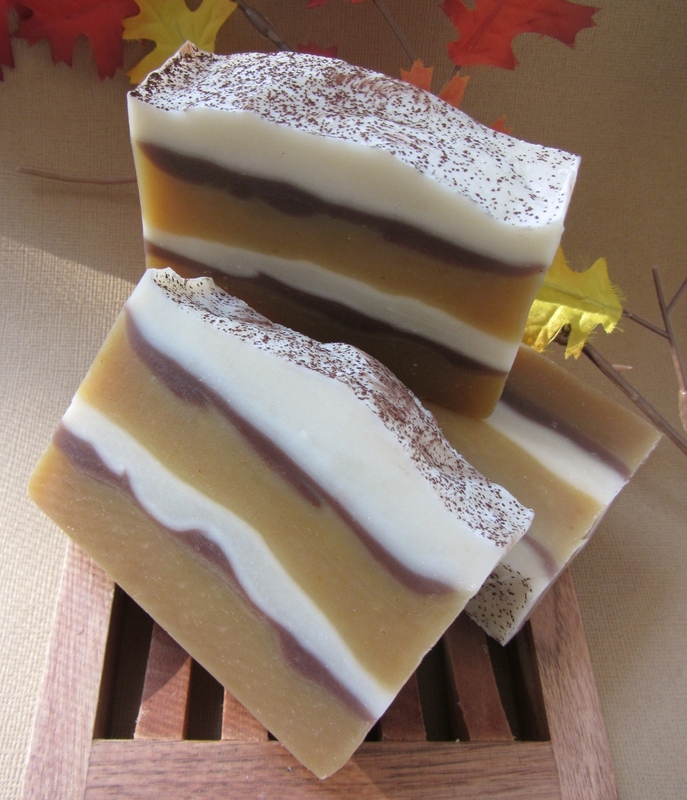 What I'm continuing to learn as a soap maker is that inspiration IS truly limitless and can be found...everywhere! In addition, and always important to remember is that inspiration lies completely in the mind's eye of the beholder. We are all unique, and so too are our inspirations. Here's to going forth and being inspired! I'm always amazed at the beauty of the fall season! Leaves in shades of red, gold, orange, and yellow come together in an explosion of color that is unsurpassed! What a great time of year to not only enjoy the color extravaganza, but to also focus on typical traditions like apple cider sipping, soup suppers, warm sweaters, visits to the pumpkin patch and, of course...fall soap making. I have made a few batches recently trying a technique new to me... the mica swirl. 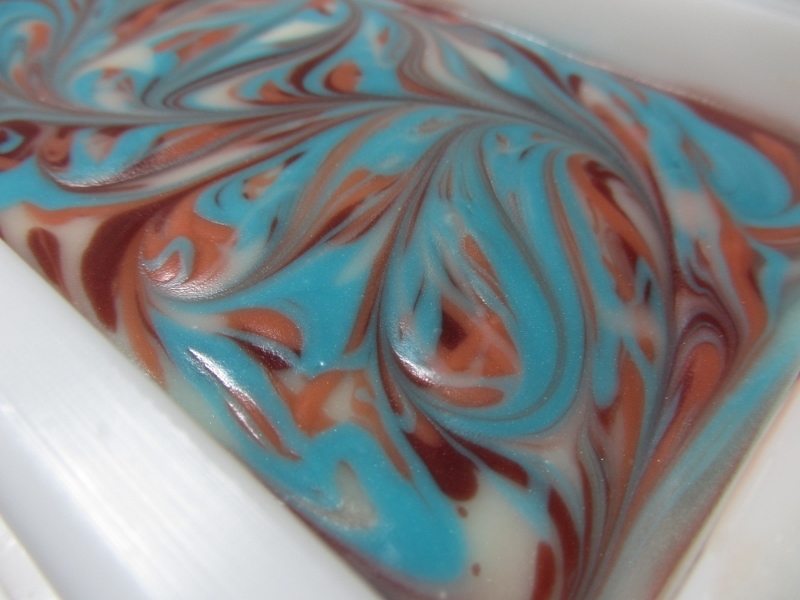 I thought it was pretty easy and a fun way to add interest to the top of soap! 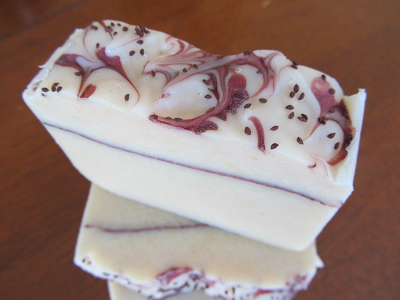 The first soap that I made was fragranced with a harvest-type scent. I added gold and copper micas to sunflower oil keeping them mostly separate, but allowing them to blend just a little where they met in the middle. I used a dropper to disperse the micas over the soap and then used a wooden skewer to feather the color out. 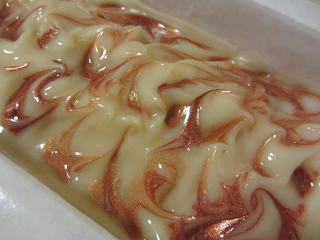 The result was an almost leaf-like pattern that was a perfect complement to this fall-fragranced soap! Due to the vanilla content, it is curing out to a beautiful rich brown which is causing the mica swirl to "pop" out even more. Inspired by the results, I decided to try it again. 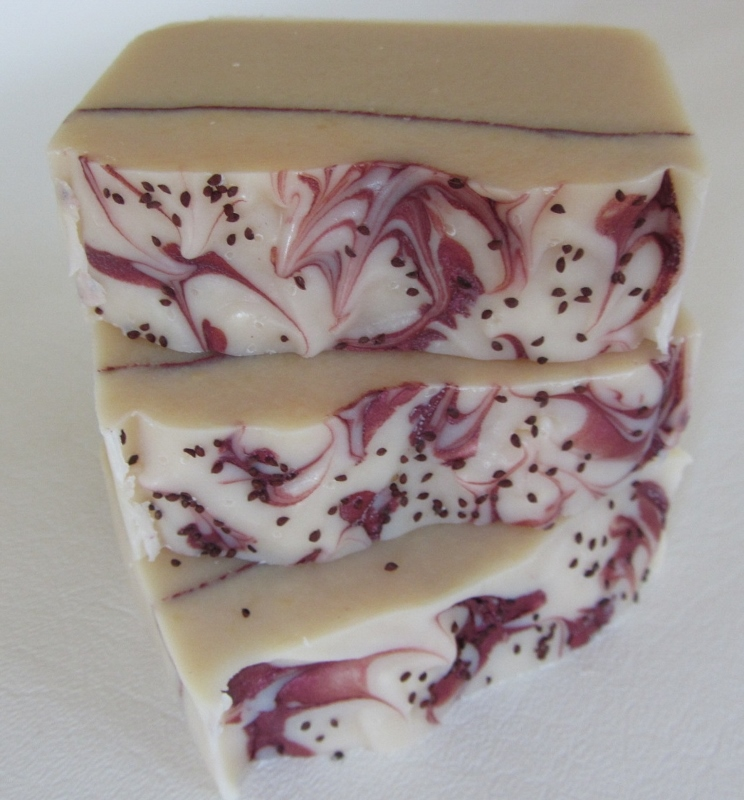 I used a familiar and favorite fragrance, Cranberry Fig. The swirling color of choice was merlot mica dispersed again in sunflower oil. I wanted to keep the bar simple, adding only a pencil line of merlot mica and a light topping of cranberry seeds. The merlot mica creates such a beautiful contrast against the creamy color of the soap. I would give the mica swirl technique a definite 'thumbs up'. 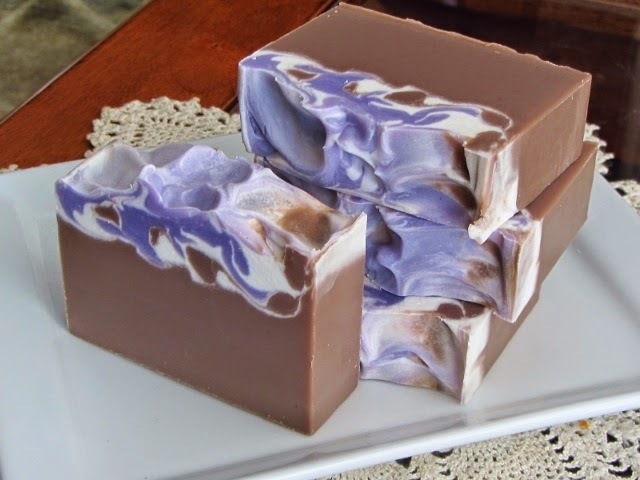 It's yet another fun and easy way to get creative with soap! 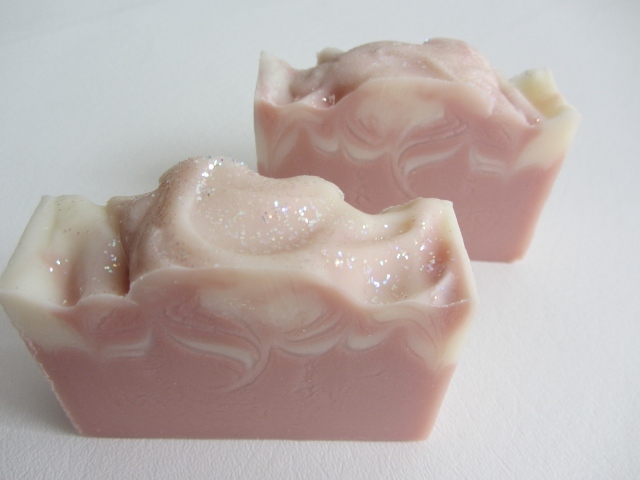 I am a soap and candle maker living in the beautiful Pacific Northwest. I share this amazing journey called life with my husband, children, and two very precious grandchildren. God is good, life is good!